Doklam region involved in the Bhutan-India-China conflict. Source: Indian Defense Review. Since the trespass by the Indian troops in the Doklam region, China has reiterated its stance many times. Since the independence of India in 1947, the Indian government has repeatedly confirmed this effect. However, India has said that its troops have not trespassed into Chinese territory, but instead have been located at the tri-junction point. China has claimed Doklam as Chinese territory and under Chinese jurisdiction without disputes. China’s activities in this area have not breached any agreement or undermined the status quo. India has claimed that their role for sending troops over the China-India border is for security concerns and New Delhi has used Bhutan as an excuse to justify its illegal boundary crossing which has trembled on international law and infringed on China’s territorial sovereignty. On the other hand, China has the will to solve the problem through diplomatic means and cherishes peace and tranquility in the border areas. Whilst, the precondition to resolve the Doklam dispute is the immediate unconditional withdrawal of Indian troops to the Indian side of the India-China border. China has accused India for using the protection of Bhutan as an excuse to stage the incursion into Chinese territory. India’s position on this issue is very contradictory to China’s and it’s two-fold. On one- fold, the Doklam territory is disputed territory between Bhutan and China and not between India and China. New Delhi has a very close relationship with Bhutan and was called in by the Bhutanese to assist. The second-fold, as India sees it, is China changing the status quo by building a road in this disputed territory. If there had been no road in this disputed territory, then the Bhutanese would have not called India for assistance and Indian troops would have not been there. This is important strategically for India because the Doklam region is very close to a place known colloquially as the ‘chicken’s neck’, which is a narrow strip of territory that connects India’s northeast with the rest of the country. So, the strategic implications of this road being built over the Doklam with negotiations taking place to settle the final status of this dispute is quite high. The fact that Indian troops are spotted in this region is concerning, but it changes the whole dynamic of the military situation on the ground and it is also crucial for China, India, and Bhutan to come to some sort of agreement to avoid any further escalation. China has said that the Doklam area is Chinese territory which dates back to a treaty it signed with Great Britain, and the kingdom of Sikkim in 1898. The Chinese side is very clear about this area belonging to China and they see India using the so-called territorial disputes between the Kingdom of Bhutan and China as an excuse to send its troops into Doklam. If the Indian side really wants to build up this case of sending its troops to the Chinese side of the border for many weeks, then the argument from the Indian side would seem to be flimsy. If the Chinese build a road on the Chinese side of the border, and the Indian side claimed that they are being threatened by the road building, then the Chinese will continue building roads on their side of the border and the Indian side will have to deal with it. If you look at the international situation, a country has the right to build a road within its own borders. The solution going forward is for India to withdraw its troops and the longer India keeps its troops there, the more this conflict will turn into a confrontation between China and India at a time when China nor India can benefit if this breaks out. Bhutan is a sovereign state that enjoys its full independence and India has no right to treat the Kingdom of Bhutan as a protective state. India is sending its troops into the Chinese side of the territory by using Bhutan as an excuse because if this is the case India wants to use, then there is a possibility that a confrontation could break out. China is demanding the immediate withdrawal of Indian troops and this is serious because India has no legitimate reason to deploy its troops into a foreign territory. What China could do is unilaterally demand India to pull troops back without paying a price. If there is something to be negotiated, it should be discussed between China and Bhutan. At this point in time, China-India relations have been on a downward spiral. If India does not move its troops back, then the China-India relationship will deteriorate and India does not really have the ground to demand a diplomatic payment because the dispute should be between China and Bhutan for border management protocol. 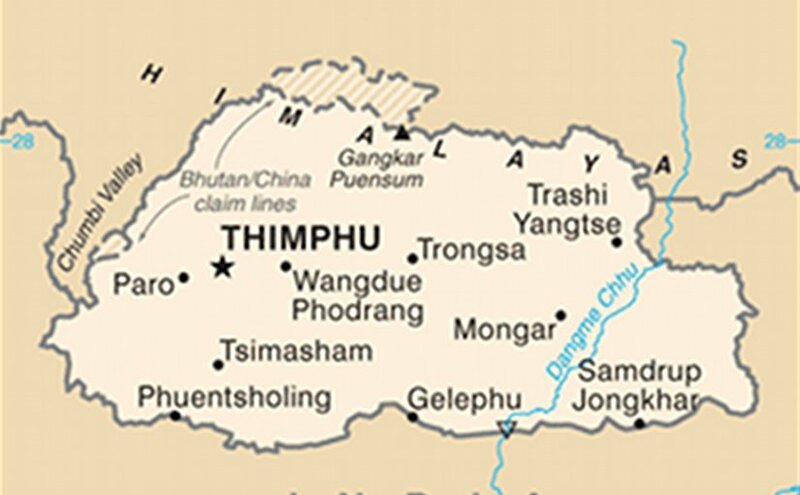 Map of Bhutan. Source: CIA World Factbook. Indian External Affairs Spokesman Gopal Baglay recently called for a de-escalation of tensions in the area, and reiterated that “”differences” should not become “disputes””.i One of the most striking things about this standoff is the difference in tone and rhetoric between Beijing and New Delhi. From Beijing, the statements from the foreign ministry and the state-run media is a great deal of belligerence. On the other hand, the view from India is much more muted and mature. China and India are no strangers to border disputes and there is still a standoff on Aksai Chin, a region in Kashmir. The way to deal with this issue of Doklam is to talk things through and to not amp up the rhetoric that threatens both countries. In the past, China and India have had a good record of handling border issues, there may not be a conclusion on the issues, but there has not been a shot heard in over forty years. In the future, China and India will deal with Doklam in a mature way and it makes no sense for Beijing and New Delhi to ramp up another confrontation. In addition, China should not position itself as a hostile country and it should not exacerbate the issue into a larger context than it needs to be. The fact of the matter is that the China-India feud in the Doklam is a dispute. Also, what is the Bhutanese claim? The Bhutanese claim is that they want to decide what the nature of its relations with China and India will be. In this case, the Bhutanese feel threatened and they have called upon India in an official statement to the foreign ministry to recognize Bhutan’s interests in this dispute and that is a peaceful resolution to the situation. China and India are two of the most respective Asian powers in the world with not only large economies, but long borders. However, if you look at the economic and trade relationship, there is some wiggle room for Beijing and New Delhi to reach some sort of peaceful solution to avoid a direct confrontation. There is a lot to overcome in this feud between China and India, but this is not so much in the economic and trade relationship as much in the regional and multilateral relationship. Both Beijing and New Delhi have a common understanding on many global issues like combating terrorism and climate change while there are some obstacles on regional issues in the Asia-Pacific like the South China Sea dispute. Overall, there is enough for both sides to overcome the Doklam border situation, both heads of state have met frequently, held bilateral negotiations at various forums just recently at the G20 Summit, and this will be a long-term affair on the border that will enhance global governance issues as well as BRICS issues. However, the bilateral relationship will suffer the longer this dispute goes on. It seems unlikely that China and India will turn the Doklam dispute into a direct confrontation, and this conflict will be solved through diplomacy. The status quo must remain for there to be any peace along the border. More importantly, Beijing and New Delhi need to move ahead and work together on other aspects of the China-India relationship. This conflict will continue, but China and India both believe that they have no intention of getting involved in a military confrontation. There is also a realization that there is too much at stake for there to be anymore escalation between the two Asian juggernauts. The Doklam issue may be a pinprick, but there has been a slow downturn in China-India relations on a geopolitical scale. This could also be a symptom of larger issues and both countries need to re-engage in a resolution through their high-level meetings. Beijing and New Delhi also need to ask the difficult questions. Why is the trade relationship so strong while there are differences on geopolitical issues? The answer to this question is simply shared interests. In addition, there must be a return to the status quo, but what is the status quo? If we go back to the situation where Bhutan and China were disputing this piece of land and there is no building going on, then it’s a status quo everyone would be happy with. If the military issue keeps going, then there will be some serious shakiness from all parties involved in the dispute. We also need to acknowledge that the China-India relationship is very complicated. There are so many common political and economic interests, but there are also a lot of disputes on India’s membership into the Nuclear Supplies Group (NSG), the border disputes in Kashmir, and China is somewhat uncomfortable to see the growing India-United States defense ties. At the end of the day, Indian troops must withdraw from Doklam. Even though India has gone out on a limb supporting Bhutan in a place where Bhutan themselves do not hold jurisdiction, India might have gone too far, and New Delhi needs to find a way to get its troops back on its side of the border so then the Chinese and the Bhutanese can bilaterally discuss this border dispute.